The forex moves in trends, the trend can be bullish (up-ward), bearish (down-ward) orHorizontal (sideways). The approach of this scalping trading system does not care which direction the price wants to move, it is more concerned about making a min. of 40 pips per day from the online forex market trading. When using this forex scalping software the concept is; your success is not in the number of pips you make but in the volume you entered in. 1. Continuous automatic pivot calculator (Which works on metatrader platforms only). 2. An average forex daily range calculator, Average weekly range calculator and Average monthly range currency calculator (Also works on metatrader platforms only). For the range forex calculators, I have already done my research to discover the currency pairs this trading system work with. (you may use it to research more on your own). 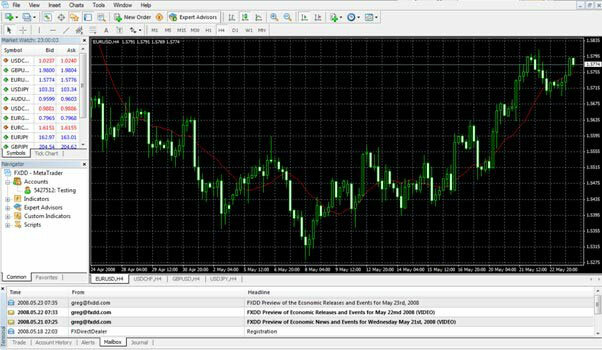 The Above is an EUR / USD 4 hours fx Chart on metatrader platform Nov/Dec 2008. Pick the vertical line from the fx tool bar and demarcate the previous day from the present day make sure the line shows the present day's first candlestick at 00:00 Hours. Count 40 pips above line X and draw another horizontal line exactly 40 pips above line X and call this line; line X 1. Count another 40pips above line X 1 and draw your horizontal line X 2 exactly 40 pips above line X 1. Count 40pips below line X and draw a horizontal line exactly 40 pips below line X, call this line; line X 3. Count another 40pips below line X 3 and draw a horizontal line exactly 40 pips below line X 3. Line X is the starting point, allow price to dance between line X 1 & X 3 until it picks its direction for the day. Set your buy stop on line X 1's price value, your take fx profit must be at line X 2, stop loss must be at line X4. Set your sell stop on line X 3's price value, your take profit must be at line X 4, stop loss must be at line X2. - Price could trigger your buy order and hit your take profit of 40pips. - Price could trigger your sell forex order and hit your take profit of 40 pips. - Price could trigger both your buy order and your sell order, hit both take profit zones, giving you a profit of 80pips. - Price could hit your buy order and not reach your take profit, come back downwards 80 pips to hit your sell fx order and give you a loss of 80pips. - Price could hit your sell order and not reach your take forex profit, come back upwards 80pips to hit your buy order and give you a loss of 80 pips. To reduce the number of Instance 4 and five in a month, repeat the pending orders explained above immediately you take your first profit for the day making the triggered take profit your next starting point. That is your line X. With this system, you can catch 40 pips out of every 81pips price movement no matter the direction it goes. But let's just say 90pips to be on the safe side, 90 pips was the criteria I used when doing my research, price can have up trends for three months, moving thousands of pips upwards or downwards. Consequently, if the price moves 1000pips upward or downwards in a month, you'll have the chance of catching almost 500 pips during such a month. The Forex broker Account below starts with 400USD and after 15 Trades became 4,440USD. Please stick to the rules of this forex system. Don't be too much in a hurry. You are expected to use half of your buying power in setting both forex trades. This enables you to enter a hedge when instance 4 and 5 above occurs. Never wait for price to cut X 1 or X 3 and use all your buying power . The above blue print does not guarantee that you'll win 15 Trades consecutively; it is a guide to help you when entering positions. Shift the stop loss of yesterday's trade to be the same as today's pending order counterpart. Instances where you see a reversal pattern you can close yesterday's trade immediately. If you don't understand how to read charts, then just leave it set along with today's trade. I need more info on the GMT timing: If my broker is on GMT+2, should I split the 2 hours earlier candle? Which first candle of the day should be split, the first 1H or 4H? Your chart is not very clear. You mention some attachment about pivot calculator, what is its role on your strategy? I didn't see any involvement with pivot calculator.